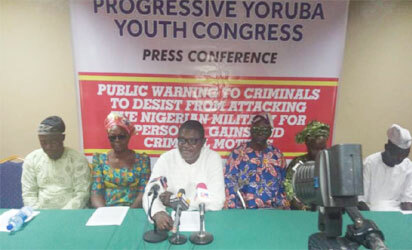 A group, Progressive Yoruba Youth Congress, has urged Nigerians to rise up and support the country’s army. The group also called on what it tagged “agents of darkness” to desist from attacking the Nigerian military for the purposes of personal gains and criminal motives. Addressing a press conference in Lagos on Monday, the group’s national president, Kola Salawu warned that those who think they have the monopoly of mischief to for once respect the sanctity of life and not drag our army into the mud because of whatever it is they stand to gain. He warned them to leave the Nigerian Army and its leadership out of their mischief or else Nigerians will take up serious actions against them and their sponsors. The strength of a nation is reflected in the strength of its army. It is on this note that we have invited you to this press conference to express our growing concerns with the activities of those that are out to undermine the Nigerian military, particularly the army, without thoughts for how their activities impact the overall stability of Nigeria as a country and the consequences of same for the safety and security of citizens. “These activities are unfortunately being packaged to appear as patriotic activism so that members of the public would be deceived into thinking that they are in the best interest of the society. The intent of this strategy is apparently to get people to support the perpetrators of these evil acts in rubbishing the Army and destroying their own country without knowing it. “We have identified sham Civil Society Organizations and non-governmental organizations (NGOs) that have been deployed for this purpose. In some instances, the operators of these groups leverage on their personal notoriety to achieve the same results. First, they query the defeat of Boko Haram and tried to use fake news to reinvent a new brand of terrorism. They have in some instances attributed accidents and robbery incidents to Boko Haram just so that they can claim that the terror group is still larger than life. These people have been manipulating reports of incidents involving the army in manners that could cause disaffection for troops on national assignments. This includes attributing attacks carried out by Boko Haram terrorists to the Nigerian military so that they can use such to whip up sentiments against the army. “They also create the impression that soldiers are always slow to respond to distress calls whenever terrorists attempt to attack vulnerable communities. Reports in this regard are manipulated to create the impression that the military is indifferent to the plight of communities where terrorists attempt to stage raids. “Distortion of casualty figures is another of the strategies that we have seen adopted by these callous groups. It is not unusual to see them exploiting the freedom of expression possible with social media to lie about what transpired during military operations. In the desperation to prove these non-existing attacks by Boko Haram they use fake pictures, often from several years ago or from other countries, to paint every effort by the Buhari administration black. “They assign disproportionately higher casualty figures to the army while downplaying the losses suffered by terrorists. This can only be aimed at demoralizing soldiers, boost the morale of terrorists and sow fear in the hearts of citizens. “The most worrisome dimension that has been introduced in recent weeks is that these groups and dubious individuals are now encouraging military personnel to breach the confidentiality required in their line of duty by asking that they leak classified documents that include operational plans and strategies. They romanticize this criminal demand by making it seem that the personnel are being recruited to be patriotic whistle-blowers when in reality they are being recruited to divulge sensitive information and intelligence about troops movement which these perpetrators then pass on to terrorists. This perhaps explains the spate of ambushes that troops had come under in recent weeks. “These groups and individuals have also been identified as receiving funds from opposition politicians and foreign entities for recruiting and paying military personnel to stage protests that are aimed at creating the impression that all is not well within the army. A key giveaway has been the well-produced video clips from such incidents, which are then heavily promoted online and in the social media. “After deploying all these strategies and still failing to achieve their objectives, they have now created a new one of trying to make the world believe that funds meant for military are being misapplied. These are the same characters that had earlier argued that the military does not need money. Which leaves us to wonder that money they are now talking about after trying to block funds for the procurement of arms and ammunition. “We have taken time to review these activities of these groups and individuals and the inevitable conclusion is that they out to discredit the army for the purpose of achieving selfish economic and political goals. If Nigerians allow them to succeed they would successfully undermine a critical institution in the life of any country, the military. We are concerned that what these people want is to revive Boko Haram as a fearsome terror group. “It is for this reason that we are raising the alarm now before they can significantly undermine the army to the point where terrorism that has been degraded is again given a new lease of life. There is no gainsaying the fact that any resurgence of Boko Haram, as being championed by these evil people, would place our people in the south-west in the line of fire and it is something we do not want to see happen. In the same vein, we would not want to see our people that are resident in the north becoming victims of the evil circuit that is bent on destroying the army. “The Progressive Yoruba Youth Congress therefore, in the strongest terms, condemn those attempting to ridicule the military for selfish gains. We warn that those who think they have the monopoly of mischief to for once respect the sanctity of life and not drag our army into the mud because of whatever it is they stand to gain. We warned them to leave the Nigerian Army and its leadership out of their mischief or else Nigerians will take up serious actions against them and their sponsors. “If they are so desperate to be relevant or to remain in the limelight, may we suggest that the funds they are deploying to undermine the Nigerian Army should be redirected to providing relief materials to the Internally Displaced Persons (IDPs). Visits to the several IDPs’ camps would likely open their eyes to the realities of what has happened in the north east and what the military has been able to avert on behalf of the country. “Much as they pretend to be driven by patriotic activism, we want to emphasise to them that true patriotism would be to single the Nigerian Army out for praises for their efforts in dealing with the existential threats that could have destroyed the country. The same accolades go to the Chief of Army Staff (COAS) Lt. Tukur Yusuf Buratai, as records abound that he takes the welfare of his officers and men seriously – has visited the theatre of operation more than any of his predecessors and has shown repeatedly that he is humanely concerned about the wellbeing of troops.